Never has the world been more accessible for travelers than it is today. Every aspect of a holiday can now be researched and arranged online, from booking a flight and hotel to finding the best things to do at your destination. Whether you are a student taking a year off to see the world, a family on their annual holiday, a professional on a business trip or a couple looking for a get-away, travelers today stay connected to their friends, family, and colleagues through modern technology. Many make do with their smartphone cameras and apps; however, let’s face it, some things are just so much easier to do on laptop. We have checked out the laptops out there and have come up with our Top Five Picks for the best laptops for travelling. The first few considerations for a travel-friendly laptop were pretty easy to pinpoint. People want a laptop that they can carry around with ease. This translates to the laptop’s size and weight. Another key feature for travel laptops is the need for a long-lasting battery. A laptop’s weight is, hands-down, the biggest factor an experienced traveler considers. It is a feature that is important regardless of the mode of travel. People taking flights must always bear in mind the maximum allowable weight for both check-in and hand luggage. Failure to comply with these weight limits results in expensive penalties. Backpackers are already weighed down by their packs. Adding an unnecessarily heavy laptop on top of everything else is never popular. Even those taking ground transport like buses, cars, and trains, seek light-weight laptops. They may not need to travel long distances while simultaneously carrying their laptops; however, they do need to haul their bags back-and-forth a lot. Adding the weight of a bulky laptop just adds to the frustration. We have found that a laptop weighing three pounds or less makes a significant positive difference in the travel experience. Size is the next biggest consideration when choosing the best travel laptop. While a laptop’s size does have a direct correlation with its weight, its size is also a significant factor when it comes to storage. When traveling, storage is significantly limited. Even if you had the world’s lightest 17 inch laptop, you would still likely have a difficult time finding a spot for your large laptop in your bags. Ideally, you want a laptop that is slim and can be easily tucked away in a jiffy. We found that a 13 inch laptop fits this criteria perfectly. When traveling, you never know when you will be able to charge your laptop. Facing uncertainties, including the uncertainty on whether you will have access to an electrical socket, is part of the package when traveling. A laptop that has a long battery life is a huge benefit to travelers. Imagine wanting to use a 12-hour flight to catch up on some work and only having a maximum battery capacity of 2 hours. A traveling laptop needs to be durable. It needs to withstand shocks and vibrations from being constantly on the move. Most laptop casings these days are very durable and made from metal or tough plastics. They can handle a few sharp knocks here and there. In addition to the chassis, the inside components also need to be up to par. While we cannot do anything about motherboards and circuits, we can, however, do something about the hard drive. A traditional hard disk drives (HDD) is basically a very fast spinning metal disk that stores your information. They are quite fragile and susceptible to damage from sudden shocks. On the other hand, the newer solid state drives (SSD) are much sturdier due to the fact that it has no moving parts to knock about. Due to this, we looked at laptops with a tough exterior as well as SSD hard drives on the interior. When looking for a laptop for travel, peripherals are often overlook during the selection process; yet, overlooking them can often lead to buyer’s remorse very quickly. If you are expecting to Skype home to your family with your laptop, you need to make sure that your laptop comes with built-in speakers, microphone and webcam. If you plan on transferring camera photos from its SD card to your laptop, you better make sure that you get a laptop with an SD card reader. If you are bringing your laptop for a business trip and need to hook it up to a projector, you won’t get very far if your laptop is short on USB or HDMI ports. There is nothing worse than having to haul a bunch of external peripherals around together with your laptop. Forgetting to check on the peripherals is a quick way to add bulk and weight while losing precious space in your bags. For our #1 Pick for Best Travel Laptop, we had to go with the Lenovo Yoga 900 2-in-1 . This amazingly versatile 13.3 inch laptop is classed as a 2-in-1 where it can be used as a traditional laptop when in a clamshell configuration or you can flip-and-fold the keyboard back to transform it into a tablet. The unique 360° hinge also allows for a variety of other styles such as a standing tent for presentation mode. The screen has QHD+ level resolution of 3200 x 1800 and is a touchscreen – a vital feature when working in tablet or presentation mode. The Yoga 900 comes with a 2.2 GHz dual-core 6th-generation Intel Core i7 processor and 8 GB DDR3 memory. It also has a 256 GB SSD hard drive. The Yoga has built-in JBL stereo speakers and microphone. In addition, it has a 1 megapixel 720p High Definition (HD) camera. For those that want a little more privacy to their calls, the laptop also comes with a microphone headset jack. The Lenovo Yoga has two USB 3.0 ports, a USB (Type C) port, a USB 2.0 port and a 4-in-1 card reader that can read SD, MMC, SDXC, and SDHC cards. The Lenovo Yoga 900 weighs just 2.8 pounds and is 0.59 inches thick. Its slim design is perfect for easy portability. The Yoga is reported to have up to 9 hours of battery life. As far as travel laptops go, the Lenovo Yoga 900 is pretty much the cream of the crop. ASUS’s 13.3 inch ZenBook UX305UA is a slim and compact laptop that is perfect for travelers. It has a sharp Full High Definition (FHD) screen with an ultrawide viewing angle of 170°. This is a great laptop to have if you plan on using the laptop under the sun or in bright light conditions thanks to its IPS Anti-Glare Matt Display. The ASUS ZenBook UX305UA is reported to have up to 10 hours of battery life. Its all-aluminum body provides a tough shell for its sensitive components at a light 2.9 pounds. Speaking of components, the ZenBook houses a 2.3 GHz 6th-generation Intel Core i5 processor and 8 GB DDR3 RAM. It also comes with 256 GB SSD hard drive. The laptop comes with an array of peripherals, including a 1.2 megapixel HD webcam as well as built-in speakers and microphone. The ASUS ZenBook also comes with 2 USB 3.0 ports, a USB 2.0 port, and a micro HDMI port. Acer has been in the industry for a long time and knows how to give laptop users exactly what they want while keeping things affordable. Travelers will find the Aspire S 13 fits any number of their criteria perfectly. The 13.3 inch Aspire comes with Full HD widescreen and a LED-backlit display. Pictures are clear and colors are bright on the Acer Aspire S 13. The Aspire S13 core includes a 2.3 GHz 6th-generation Intel Core i5-6200U CPU and 8 GB LPDDR3 RAM. It has 256 GB SSD storage. The laptop features two built-in stereo speakers and microphone together with a 720p HD webcam. Along the sides, the Aspire S 13 has a USB 3.1 (Type C) port, two USB 3.0 ports, a HDMI port, and an SD card reader. The Acer Aspire S13 can last up to 11 hours and weight a slight 2.87 pounds. One of the most popular ultrabooks in the market is Apple’s MacBook Air. The latest MacBook Air comes with a 13.3 inch LED-backlit glossy widescreen display with a bright 1440 x 900 resolution. Inside, the Apple MacBook Air has a 1.6 GHz dual-core Intel Core i5 processor and 8 GB LPDDR3 memory. The MacBook Air also comes with 128 GB PCIe-based flash storage. As far as peripherals go, the MacBook Air has dual microphones to reduce background noise as well as built-in speakers and a 720p webcam. It also has a jack for microphone headsets. There is a slot of SDXC cards as well as two USB 3.0 ports and a Thunderbolt 2 port. The MacBook Air’s keyboard is backlit. A traveler who works on their laptops in darkened environments would certainly find this feature to be quite useful. The MacBook Air has got a great battery life of up to 12 hours. It is just 0.11 to 0.68 inches thick and weighs 2.96 pounds. Versatile 2-in-1 laptops are great travel companions. It allows travelers the added usability of laptops while also allowing for the convenience of tablets. Microsoft’s Surface Pro 4 has gotten a lot of great reviews and is one of the leading hybrids out there. This 12.3 inch tablet/laptop has a sharp 2736 x 1824 resolution on a high contrast and low glare screen. Inside, Microsoft’s latest Surface Pro comes with a 6th-generation Intel Core i5 processor and 4 GB memory. It includes 128 GB SSD storage. The Surface Pro 4 has up to 9 hours of battery life and comes with a USB 3.0 port, a mini displayport, and a micro SD card reader. 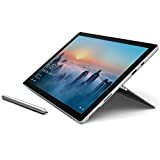 The Microsoft Surface Pro 4 has got two cameras: a 5 megapixel front-facing camera for video calls as well as an 8 megapixel rear-facing camera for taking pictures. Along with the cameras, the Surface Pro 4 has microphones on the front and rear to capture sounds. It also has built-in speakers and a jack for microphone headsets. The Surface Pro 4 is just 0.33 inches thick and is a remarkably light 1.69 pounds. Do bear in mind that, while the Surface Pro 4 comes with a stylus, the keyboard is sold separately. At the turn of the 21st century, traveling with a laptop was almost exclusively a hallmark of a traveling business professional. No one would have bothered to haul around bulky laptops for leisure. Now, just 16 years on, slim and lightweight laptops have become just another tool to carry along on one’s travels, be it for leisure or work. The Lenovo Yoga 900 and the Microsoft Surface Pro 4 combines the at-your-fingertips convenience of a tablet with the added power of a laptop. The ASUS ZenBook UX305UA, Acer Aspire S 13, and the Apple MacBook Air provides the traditional laptop configuration with performance components, a sturdy body and plenty of peripherals and connectivity. These laptops are amazingly light. Their slim bodies are encased in tough durable materials. 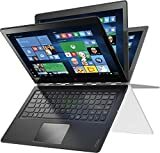 These laptops are perfect if you are looking for something that will have minimal effect on your weight limit while still allowing for convenient storage at whatever nook you can find.